Millie Niss passed away in 2009. She was a New York writer/poet, programmer, and mathematician who took her work as a new media artist very seriously. 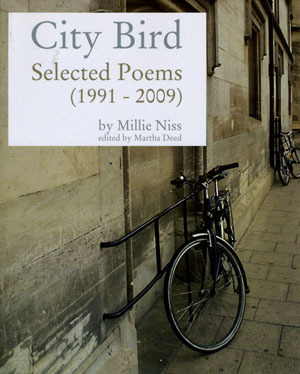 Her mother Martha Deed has put together a book of her writings called City Bird that was recently published by BlazeVox. I’ve been reading it. Anyone who knew her, in reading this book, is reminded so much of her presence, voice, humour, intelligence, suffering, and strength. It’s quite a strong statement, really, of resilience in the face of the frequent sickness she had to endure throughout her life. It’s a book I’ll keep and read over the years. I think Millie would be delighted with what Martha has done in editing this collection of Millie’s poems and getting it published. I wrote something about Millie not long after she passed away, and worked with Martha on putting some photos of Millie up on the net. I miss the Niss. Many thanks to Martha for this terrific collection of Millie’s poetry.